Daily On My Way to Heaven: Are we Busy or Distracted? I have been mediating on this passage and it came to my attention that Martha's problem was not necessarily being busy, it was something else. 1. Martha was distracted by much serving. Much serving was not the problem, having a house full of guests, or littles at home to feed or grown-ups to listen to, or having to make extra soup for a friend in need, or classes and papers to grade, and doctors' appointments to make, and laundry and exams, and a husband to embrace and a friend in need to listen to are not the real problem. The problem is how that busyness, how that much serving can distract our hearts and draw our attention to something else that will destroy our relationship with God and others. Jeremiah Burroughs in his book, The Rare Jewel of Christian Contentment, says that Christian contentment is "opposed to an unsettled and unstable spirit, whereby the heart is distracted from the present duty that God requires in our several relationships towards God, ourselves and others." This is exactly what I see in the passage. Martha's heart got distracted and her heart became unsettled and unstable. Instead of looking at Jesus, the object of her service, she looked at herself and in turn, her eyes veered to her sister in comparison. 2. 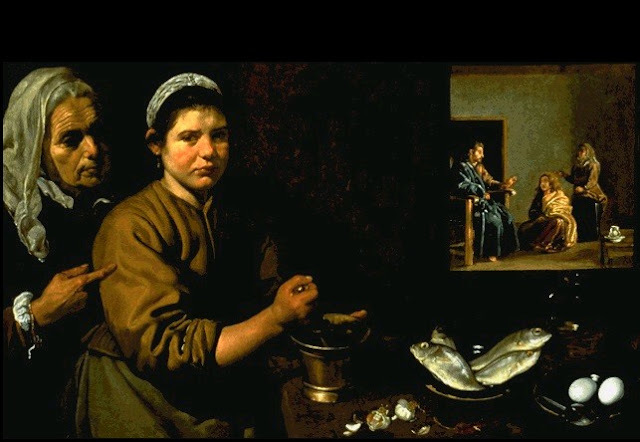 Notice that after Martha's heart is distracted, she turns to Jesus, but not to listen to Him. He looks to Him in order to complain. How could He have missed the fact that she was doing more than Mary? How could He not see her diligent service and her sister's poor attitude towards their duties? Jesus' answer goes directly to the heart of the matter. He does not address the "how-much-I-am-doing vs. the-how-much-she-is-not-doing" argument (that we moms have heard from our children too often, just like our Heavenly Father has heard from his children more than often!). Martha's problem was anxiousness, a troubled heart -not busy hands, and also the fact that she started comparing herself with her own sister. She wanted Jesus to make her an example before Mary. Martha clearly had not learned contentment in the midst of a busy day. Again we read Jeremiah Burroughs' wise words: "[Christan contentment] is opposed to murmuring and repining at the hand of God..." and "Christian contentment is that sweet, inward, quiet, gracious, frame of spirit, which freely submits to and delights in God's wise and fatherly disposal in every condition." How challenging and fitting it is for us to read this passage. Many of us are in a season in which our lives are full, trying to do less is what we dream of, but in reality we just can't. But we can do one important thing: check the attitude of our heart in the midst of all those busy moments. In doing so, we will be choosing "the good portion" that Jesus wants us to choose. So let's check our own heart: Am I continually and quietly murmuring and complaining -even in prayer? Is it my tendency to be distracted in my heart only to find myself comparing my days with those of my neighbor? Can I see my present condition and my hands full, and praise God and see Him and listen to Him as I come and go? Or am I using this busy season in my life only as an excuse to not come to Jesus to worship Him? "A Christian knows that he should not be diverted by small matters, but should answer every distraction, and resist every temptation." Jeremiah Burroughs.